IMPRESS your family and friends with a set of funny Christmas Cards! 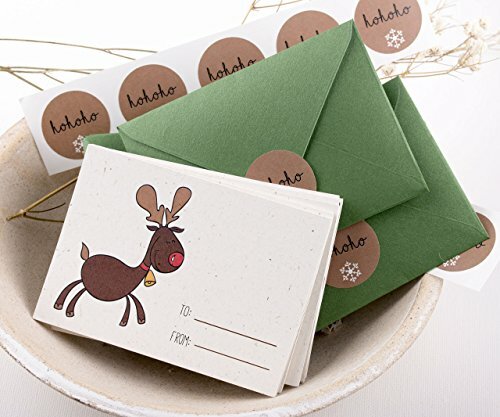 Each set comes in with luxurious metallic envelopes in green and "Hohoho" Sealing Label! These greeting cards are perfect to put a smile on your loved ones' faces. You will receive 1 card of each from the shown designs - total of 12 mini cards. ***Please note these are meant to be hand delivered, not mailed! Responding to customer's messages is usually fast during shop's working hours. If you have any questions about this product by XOXOKristen, contact us by completing and submitting the form below. If you are looking for a specif part number, please include it with your message. Boxed Set of 8 Funny Christmas Cards - "Are you Yeti For Christmas?"